The will of John Preston junior (d. 1814) set up the £2000 trust under which the Preston Grammar School was to be established. However, the will also stipulated that the "residue" of Preston's estate was to be divided into halves, one of which was left to Preston's cousins on his father's side of the family and the other to those on his mother's side. This was the reason for the powerful Ingleby family of Ripley Castle to take the will to Chancery. John Preston senior had married Jane Johnson (born 1688) in 1720 in Stokesley. Jane was quite a wealthy woman, with property and money to her name. As the only surviving child of her father Christopher Johnson she was named as his main heir in his will written in 1701. 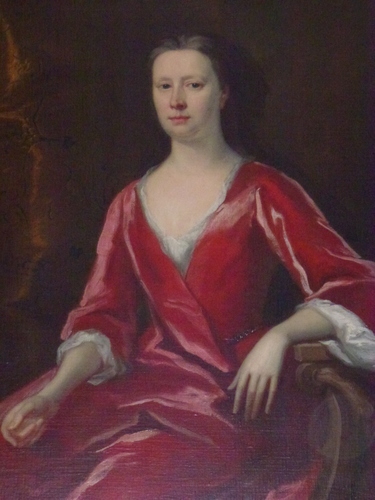 "Sir John Ingilby, Baronet, married Mrs Mary Pritchard on 28th April 1704, St Sepulchre, Holborn, London"
Thus Sir John Ingilby and Lady Mary of Ripley Castle were aunt and uncle to Jane Johnson, and their son, John Ingilby, was her cousin. Perhaps it was also as a result of this family connection that John Preston senior, Jane’s husband, became attorney and agent to the Ripley Estate. 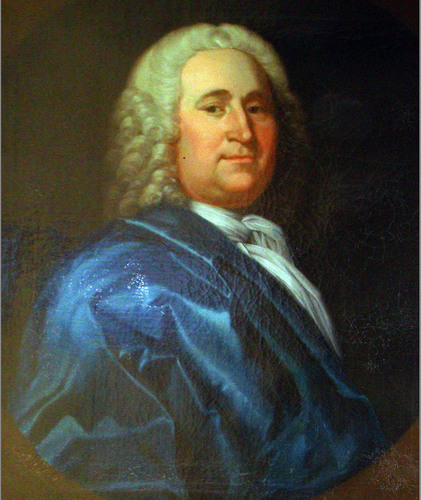 John Preston is mentioned in several of the Estate papers and the current baronet, Sir Thomas Ingleby, has said that the Estate flourished under John Preston’s stewardship. 31st January 1770 Preston, John, attorney at law. John Preston had left a will, but it apparently "remained undiscovered" for more than 30 years after his death, so it may be that some of the complications which led to his son's (John Preston junior's) will being contested in the Court of Chancery resulted from issues surrounding the failure to execute will of John Preston Senior. In any case, the outcome of what inevitably became a protracted dispute was a long delay in the establishment of the Preston Grammar School. The portrait in oils shown on the left is dated 1756 and was painted by one William Smith. It now hangs in the Boar's Head Inn at Ripley, and is reproduced here by kind permission of the landlord. The inn is still in the possession of the Ingleby family, and is situated a stone's throw from Ripley Castle where the Ingleby family still resides (they are about to celebrate their 700th anniversary there). Attached to the portrait is a plaque explaining that John Preston was the Agent for the Ingleby family in the 1720's. There are several pieces of material in the West Yorkshire Archives relating to the Ingilby Estate which show John Preston acting on behalf of Sir John between 1720 and 1783. Also amongst these documents is one referring to the grant of a coat of arms to the Johnson family of Stokesley in 1730 - presumably to add gravitas to the family of the then existing Lady Ingilby (Mary Johnson) and her heirs. The photograph on the right shows a contemporary portrait of Lady Mary Ingilby. It was Mary's marriage into the Ingilby line in 1704 (see above) which gave her husband and his descendants a claim on the estates of both John Preston senior and John Preston junior. The original portrait hangs in Ripley Castle and the photograph reproduced here was taken by Sir Thomas Ingleby himself especially for our use. Sir Thomas, the present Baronet, is Mary's direct descendant and we would like to express to him our gratitude for his kindness both in providing it and allowing us to use it here. Copyright on this photograph belong to Sir Thomas Ingleby and the Ripley Estate.